In 2016 the Mundus Journalism launched its new website and branding. From the design to the stories I really wanted to harness the synergy that is ‘Mundus Journalism’ and channel it into a website that I think reflects the current digital world it exists within. The result is a constellation that is always evolving. Since 2005 the Mundus Journalism programme has been offering a unique Master’s degree experience, with students studying media and living in at least two European countries. Students on the programme gain an outstanding professional network for life, working with peers from all over the world. This was not a re-brand. It has been about harnessing everything that Mundus Journalism prides itself and has been built on, while at the same time evolving the brand into the digital age. The end result; a brand that students both arriving and leaving feel proud to be a Mundusian of. This has been a massive collaborative effort with endless emails and late night skype dates across oceans to pull this all together. Thank you to the lovely Bettina, Line and the rest of the web development team from Aarhus University for their massive efforts. Last but not least to my partner for having the belief in me to tackle a project like this, you’re truly amazing. Mundus Journalism is an Erasmus + programme that brings together eight academic institutions across four continents to deliver a world class master's degree in journalism, media and globalisation. 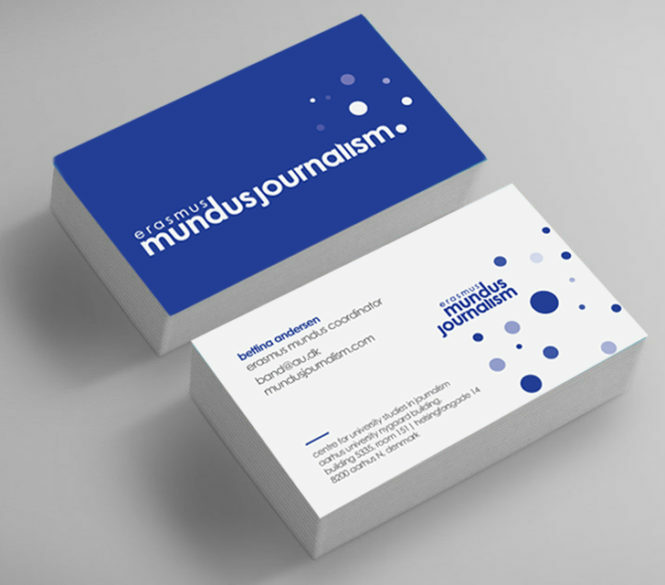 In mid-late 2016 was tasked with updating the Mundus Journalism brand identity - including logo, colour scheme, website and digital presence - to better reflect the uniquely global position this degree occupies. From the logo to the website ux I really wanted to harness the synergy that is ‘Mundus Journalism’ and channel it into a brand that I think reflects the digital environment it exists within. The result is centred on the idea of a constellation that is cohesive and unifying; global yet reflective of the individual institutions that together make the programme a whole. Since 2005 the Mundus Journalism programme has been funded by the European Union to deliver a unique Master’s degree experience, with students studying media and living in at least two European countries - starting in Aarhus, Denmark. Students on the programme gain an outstanding professional network for life, working with peers from all over the world. This whole project was about harnessing everything that Mundus Journalism prides itself and has been built on, at the same time as evolving the brand into the digital age. The end result; a brand that students both arriving and leaving feel proud to be a Mundusian of. Due to limitations with TYPO3 we had to release this website with the clunky menu on the left hand side. Stage 2 we will release the improved menu navigation at the top. New top menu navigation released mid October 2017.